A study published today in BMC Public Health looks at the association between adherence to healthy dietary guidelines and children’s psychosocial well-being. 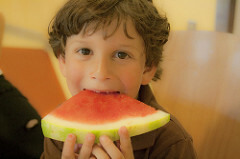 Is healthy eating linked to happiness in children and is happiness linked to healthy eating? We take a closer look at the results of a unique study carried out on a large population of children in Europe. A growing body of evidence has suggested that diet is just as important to mental health as it is to physical health, with an unhealthy diet presenting risks for depression, anxiety and even schizophrenia. Ingesting adequate amounts of complex carbohydrates, essential fats, amino acids, vitamins, minerals and water can provide feelings of well-being; diet recommendations for promoting a balanced mood include eating fewer high sugar foods and more wholegrain cereals, nuts, beans, lentils, fruits and vegetables. This is discussed further in a 2015 blog presenting research published in BMC Psychiatry which suggests that fruit and vegetable consumption may be associated with reduced psychological distress. Although half of mental illnesses first manifest prior to 14 years of age, evidence of the association between diet and psychosocial well-being in children is limited and inconsistent. Most studies are observational and it is therefore difficult to tease apart cause and effect. Furthermore, it is possible that observed associations are explained by reverse causality – ie: mental ill health promotes an unhealthy diet rather than the other way around. This calls for a need for more prospective studies on the subject. In a study published today in BMC Public Health, Louise Arvidsson and colleagues have investigated the bidirectional association between adherence to healthy dietary guidelines and children’s psychosocial well-being. They have also examined how the associations might differ between children with different weight status. 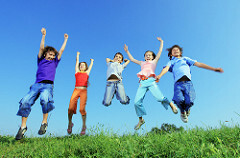 It is the first study of its kind and the study findings are unique in that they are based on a large longitudinal study of children from different parts of Europe, adding to the largely cross-sectional, current evidence on diet and psychosocial health in children. The researchers examined 7,675 children two to nine years of age from eight European countries – Belgium, Cyprus, Estonia, Germany, Hungary, Spain and Sweden. At the beginning of the study, parents were asked to report how often per week their children consumed food from a list of 43 items. Children were then assigned a Healthy Dietary Adherence (HDAS) score depending on the consumption of these foods. The HDAS aims to capture adherence to healthy dietary guidelines, which includes limiting intake of refined sugars, reducing fat intake and eating fruit and vegetables. A higher HDAS indicates better adherence to the guidelines and therefore healthier eating. The researchers also measured children’s weight and height and assessed well-being based on self-esteem, parent relations, emotional and peer problems as reported by the parents in response to validated questionnaires. All questionnaires and measurements were repeated two years later. The study found that a higher HDAS at the beginning of the study period was associated with better self-esteem and fewer emotional and peer problems two years later. Fish intake according to guidelines (2-3 times per week) was associated with better self-esteem and no emotional and peer problems. Intake of whole meal products were associated with no peer problems. The researchers also concluded that the associations between HDAS and well-being were similar for children who had normal weight and children who were overweight. The associations in the study were found to go in both directions; better well-being was associated with consumption of fruit and vegetables in accordance with dietary guidelines, better self-esteem was associated with limited intake of refined sugars, good parent relations were associated with fruit and vegetable consumption according to guidelines, fewer emotional problems were associated with fat intake according to guidelines and fewer peer problems were associated with consumption of fruit and vegetables according to guidelines. Mental disorders account for the largest disability across the globe. With the 20th century seeing major shifts in dietary intakes globally, there is a marked increase in the consumption of sugars, snack foods, take-away foods and high-energy foods, suggesting that the threat of an increase in mental health disorders is bigger than ever. The findings of research such as that discussed above are important for bringing to the forefront the urgency of addressing obesogenic environments and providing prevention and treatment strategies that focus on improving our diets. Natalie joined BioMed Central in October 2007 after having completed an MSc in Environmental Health at the Cyprus International Institute in Association with the Harvard School of Public Health. She is the training co-ordinator for the BMC series editorial team and the Editor of BMC Public Health and BMC International Health and Human Rights.